It’s been a long winter. Okay, I know I say that every year, but this winter has been a record breaker. True, it hasn’t been the snowiest, but our number of sub-zero days has been impressive. The Midwest isn’t alone, either: winter has hit hard in nearly every corner of our country, and in most of the places in between. Everyone is weary of winter. Where is spring? Despite the continuing Arctic cold, there is hope. 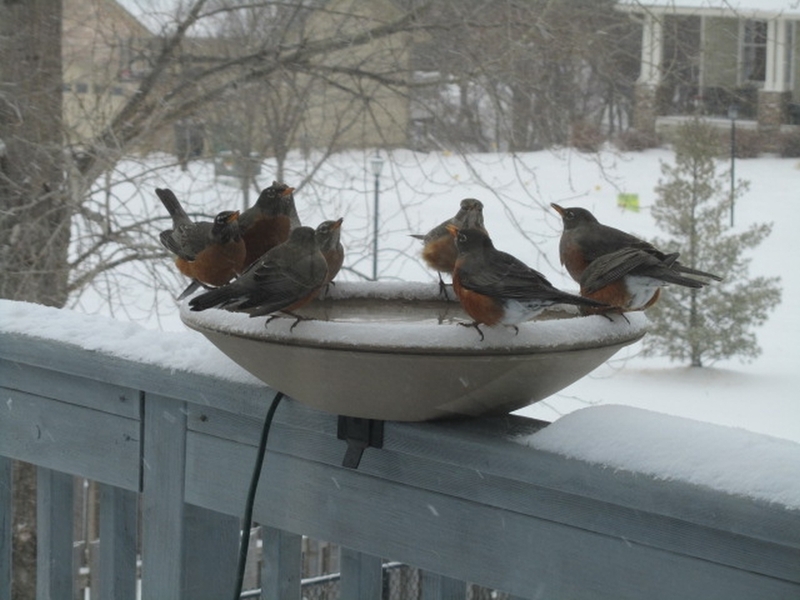 Robins are returning, and the days are noticeably longer. Such small signs whisper a promise that winter will eventually move along to the southern hemisphere, and warmer weather will rush in to take its turn. The ice and snow will melt, green shoots will emerge from the thawing ground, flowers will bloom, and gardeners who have been fighting the urge to get out and dig in the dirt will finally be able to plant their seeds and seedlings. I can already see tulips and daffodils in my mind’s eye! When we look around, we find that the state of our world can seem like an unrelenting winter. Evil is rampant, and people are suffering. War, rebellion, disease, and violence are so pervasive that we run the risk of becoming numb to them. But movies, games, and television shows are also full of such things, and although many people look to entertainment to escape the unpleasant realities of the world, they might find themselves becoming saturated in them instead. Where is God? Despite the chaos and evil in the world, there is hope. At the local food pantry, volunteers are serving those in need, helping them to feed themselves and their families. Donors are financially supporting organizations that help people pay their heating bills so they aren’t stuck in a frigid house. During the snow storm in Atlanta, fast food servers were taking food and other supplies to motorists trapped in their cars, and businesses opened their doors overnight to allow people who couldn’t get home to sleep in a warm safe place. International aid organizations can help the desperate around the world because enough people give their money to make it happen. Everywhere you see the evidence of God at work. Why would I say that the good deeds of people reveal the hand of God? Some say that the abundance of evil and suffering in the world proves that there is no God or that if there is a God, he obviously doesn’t care about us. They dismiss altruism, saying that people do good only because it gets them something in return, even if that something is only a warm fuzzy feeling. But let’s look at human nature for a moment. We are essentially self-centered. Our biological imperative is anything that ensures our survival. As individuals, we should be competing for resources for ourselves and our families; we should be guarding our territories and making sure that our genetic line continues. Sharing with others outside our families makes sense only as long as it preserves the security of the community we live in and allows us to survive and prosper. Giving to strangers, especially strangers on the other side of the world, goes completely against human nature. Let me say that again: caring for others outside our own families goes against human nature. So why do we do it? Because we are so much more than just our own humanity. Genesis tells us that when God created man, he breathed life into him. Although our bodies are flesh, the spirit of life in us is divine. That is what moves us to care for others. That is what brings us to tears when we see need and suffering. That is what spurs us to action when we see injustice. The Spirit of God in us can elevate us above our humanity if we let him. After a long, cold winter, or a long period of pain or bitterness, our hearts might need some thawing before we’re able to notice and respond to the need all around us. The good news is that Jesus is a heart specialist. He is able to thaw a frozen heart or even break and restore a heart of stone. A winter like this can make us lose hope for spring. A world like ours can make us abandon hope for God. But look around: spring is not far away, and God is already here.